Support your local merchants and enjoy the camaraderie the day after Thanksgiving at Holiday Central, Plaza Midwood’s first holiday lights festival. 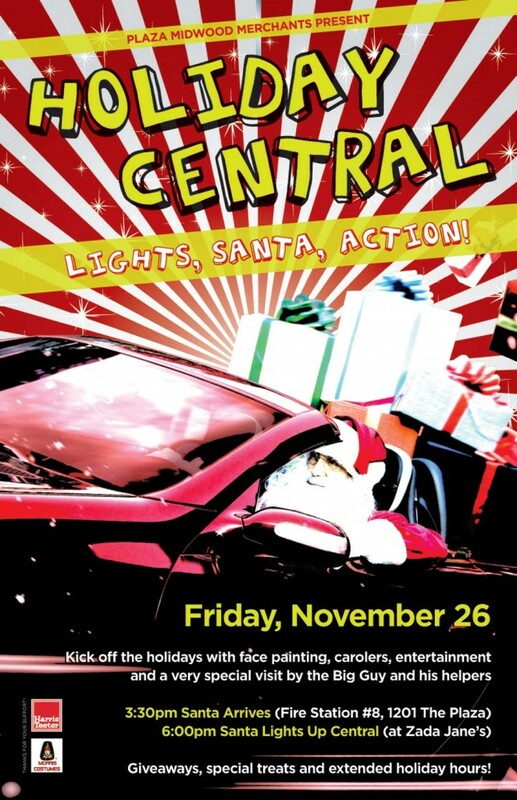 The event will be held Friday, November 26 from 3:30pm-8:30pm in Plaza Midwood, with the main activities taking place along the neighborhood’s main corridors of Central Ave, The Plaza, Thomas Ave, and Commonwealth Ave.
Santa will be at the Fire Station on The Plaza starting at 3:30pm before heading to the tree lighting ceremony in front of Zada Jane’s at 6pm. Face-painting will be available for kids, and carolers, elves, and musical entertainment will be present. Plaza Midwood businesses taking part in the festival will remain open for the duration of the event. Visit Holiday Central’s event page on Facebook for more information.